It would be very convenient to turn on the lights in the base automatically when someone opens it. There are some smart sockets out there, but most of them connect to external servers and require some special kind of software. If the vendor decides to shut down their server we couldn't use our devices anymore. 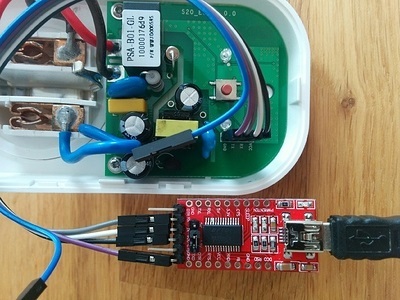 The Sonoff S20 uses a ESP8266 and can be flashed with alternative firmware. Depending on the firmware it will then support other protocols. The device is also relatively cheap. The ESP8266 GPIO 12 is connected to the relay (1=on, 0=off). The GPIO 0 is connected to the push button. Unplug the device from power! Check the FTDI jumper for voltage. #define OTA_URL                "http://webserver:80/api/arduino/" PROJECT ".ino.bin"